Your favorite holiday cocktail, spiked eggnog, is now spiked eggnog dip! 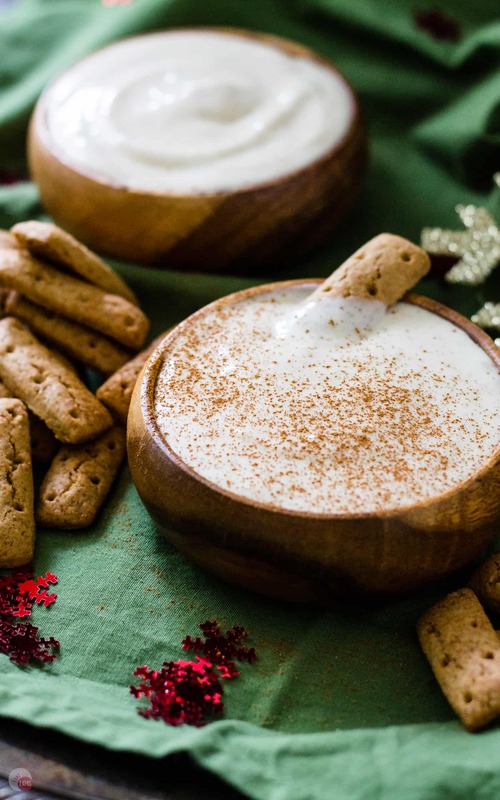 Creamy eggnog, cinnamon, nutmeg, and a hint of bourbon is better on your graham cracker than in your glass. How do you like to drink your eggnog? Do you drink it out of the carton or do you make it from scratch? Making traditional, homemade eggnog is a process and quite an arm workout so be prepared! 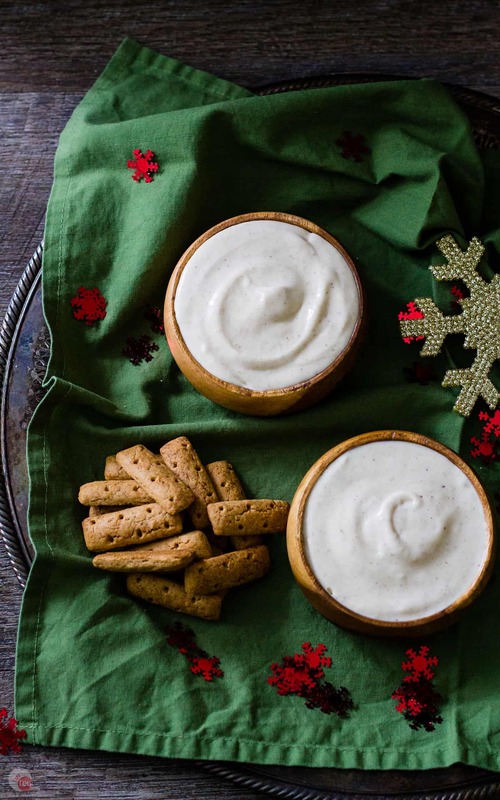 If you want to skip the gym time the best way is with my Spiked Eggnog Dip. It’s holiday time and all the stores are full of Christmas decorations even though I haven’t even eaten my turkey yet! I’m going to have to start spiking my eggnog, both in my glass and in my spiked eggnog dip, to get through it all. Holidays mean time with friends and family which is great, but it also means, hectic schedules, gift wrapping late at night, and endless to-do lists. I am not looking forward to this aspect of the season but I am looking forward to picking out gifts. I’m always excited when this season finally rolls around because I take a break from my usual tasks and queue up the National Lampoon’s Christmas Vacation DVD. Watching Clark fuss with all those lights is so indicative of my life during this time of year while secretly wishing I was Beverly D’Angelo sipping my eggnog and not worrying about the cat food in the jello mold. Just to be clear, we have never had cat food in our jello mold but we are a bunch of pranksters in our house so I am not ruling it out entirely. Let’s talk about traditional, homemade, from scratch, the only way to make it versus busy moms and not enough room in the fridge for all the eggs we will need. There are other aspects too. 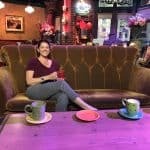 Do you serve it hot or cold, do you have to put alcohol in it, and which alcohol is best. First, homemade eggnog is made from egg yolks whisked with sugar and then mixed with cream and milk. If you are spiking it with adult beverages you would do this after the milk and cream step. Whipping up the egg whites and slowly folding them in. A dash of spices and you are good to go. Served cold. A version of hot eggnog with rum is enjoyed around the world and is known as a Tom and Jerry. Not sure I want to drink hot eggnog as it sounds like a melted milkshake but if you are into that knock yourself out. I am not in the mood for whisking and folding after all the other baking and cooking I have to do so I buy my eggnog in the carton (or bottle) from those hardworking grocery stores like every other busy person during the months of November and December. Go ahead and look down your nose at me for buying PREMADE but while you are busy making more dirty dishes I’ll be on the couch eating pizza and snuggling with my boys. It’s more fun anyway. The only reason I drink eggnog is the bourbon. I know that quite a few people use dark rum, but I prefer the caramel flavors in the bourbon to the sweetness of rum. The bourbon lends itself to the cinnamon and nutmeg spices keeping it more savory than sweet. Let’s get real for a second, having your eggnog spiked is way better than plain old eggnog. The plain, unadulterated eggnog makes me feel like I am sitting at the kid’s table for dinner all over again. Not that the kid’s table is bad but they don’t get my jokes. 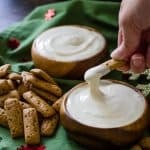 Turning my favorite holiday cocktail into a dip is super easy given the nature of eggnog. Being a rich and eggy drink, the eggnog pairs perfectly with the cream cheese I am using as the base for the dip. 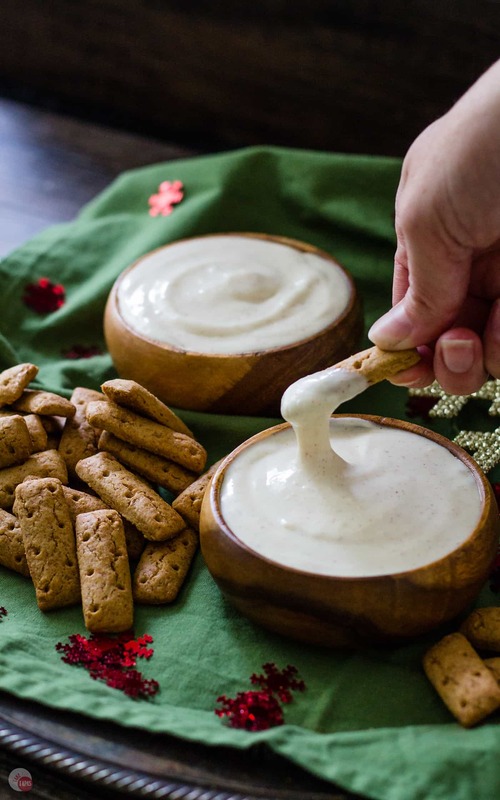 With only 6 ingredients to make this dip, you can be sure that it will be easy to throw together for last minute guests as long as you have eggnog in your fridge. Already prepared as you don’t want to repeat “arm day” at the gym right before you are going to a party. If you like to entertain like me, you will have eggnog in your fridge starting November 1st and have cream cheese on hand as it is an essential ingredient for quite a few party foods like any of my cheese balls and spreads! 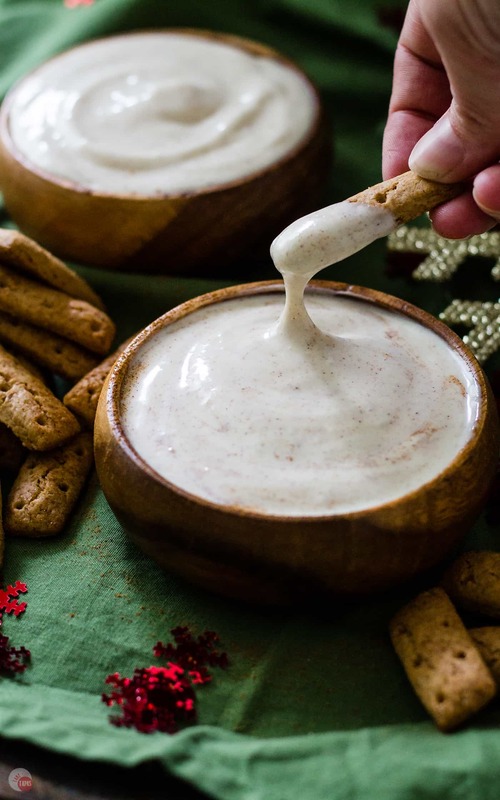 Cream cheese, eggnog, your favorite bourbon, powdered sugar, cinnamon, and nutmeg are all that is required for this delicious holiday dip! Pair it with your choice of cracker or dip-to-mouth vehicle, but I found that it tastes extra great with cinnamon graham crackers. While searching for some crackers, I came across these graham cracker dipping sticks which are my win for the day. Dusted with cinnamon they pair perfectly with the cinnamon in the cocktail and tie it all together! Believe me when I say that I will have my spiked eggnog in my glass and on my graham cracker dipping stick while I’m watching crazy cousin Eddie blow up the sewer system. All while snuggling with my kids on the couch thinking I smell burnt cat hair. 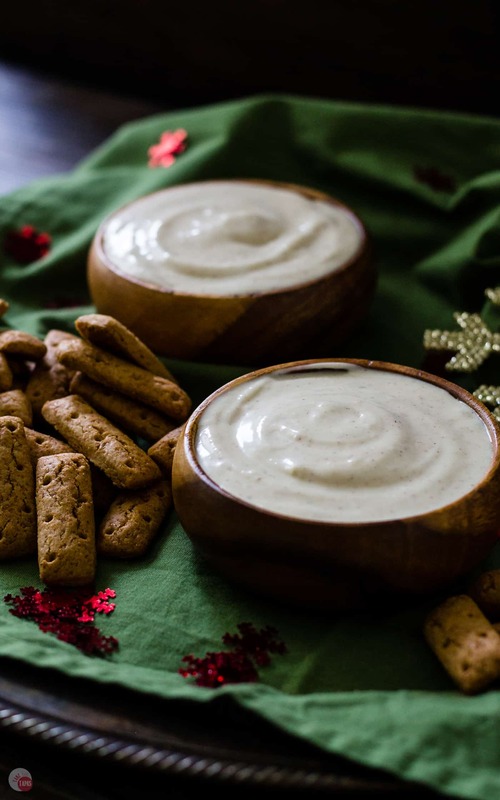 What is your favorite holiday movie and what are your traditions that go with it while eating this Spiked Eggnog Dip? Mix the cream cheese and the powdered sugar together until combined. Pour in the bourbon and the eggnog and mix completely. Add the cinnamon and nutmeg and mix to combine. Chill for 30 minutes to thicken. Serve with cinnamon graham sticks or crackers. What a beautiful appetizer for the holidays! Can you believe that I have never had Eggnog. I seriously feel as if I’m missing out. I just know I’d love it. I could go with either rum or bourbon, since I love them both, but for this dip I’m going with your recommendation of the bourbon, since I think it matches the crackers so well. Thanks Janet! I love the flavor of eggnog but can’t drink too much at one time. Now that’s a great idea! Thanks for sharing on the What’s for Dinner link up! Where did you go for you PHD in dip? I bow before thee. In my book, Eggnog is always spiked but I realize that doesn’t suit everyone. Like, 8 year olds.